For as long as markets have existed, businesses and industries have been disrupted by new technology. While the shape of decline has looked different in each industry, every structural change or “transition” has resulted in losses which have impacted investors, banks, workers and government. Transitions associated with climate change pose great risks to established economic and socio-political paradigms. Transformational impact means that getting the policy response wrong, or worse, not planning for the transition at all, will have a much more severe impact, and the spillover to the financial system and the real economy, will be much more difficult to contain. Fossil fuels have been at the centre of several of the largest geopolitical crises of the last century. Ever since the world’s nations committed in December 2015 at the COP21 in Paris to limit global warming to well below 2°C and to pursue the efforts towards the 1,5°C goal, the energy transition has continued to gain momentum in many parts of the economy with the help of technological shifts, reduced renewable energy costs and ambitious public policies. Climate Policy Initiative (CPI), with the support of Agence Française de Développement and the Advisory Finance Group of the World Bank, examined the risks to the economy of South Africa – and its government, municipalities, companies and financial institutions – from a global economic transition to a low-carbon economy and compiled this report. A global low-carbon transition could reduce the demand and price for assets including carbon-intensive fossil fuels such as coal and oil. Infrastructure which supports higher carbon activities including rail, power plants or ports built around fossil fuel industries, may have to be replaced or retired early. Companies, investors and workers could be hurt by lower prices and reduced demand for certain products. Governments may face reduced revenues, for example from lower tax receipts, while their expenditure increases for financial assistance to industries and workers in transition. 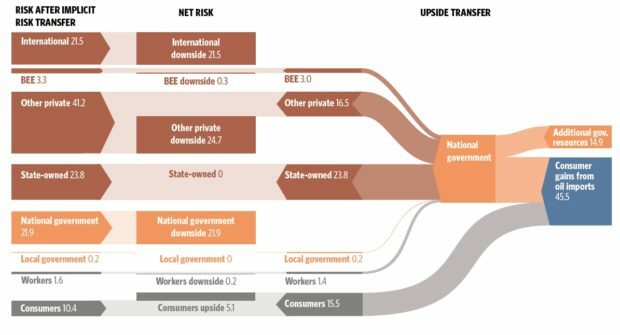 “Transition risk” is widely regarded as the risk that the value of assets and income are less than expected because of climate policy and market transformations, such as the switch away from coal-fired power. However, the analysis in this report not only quantifies the downside risk of South Africa’s transition, i.e. the negative impact on assets and revenues, but it also attempts to forecast some of the potential benefits of a transition, such as the impact of a lower global oil price that is passed through to consumers. Trade-offs associated with a low-carbon transition are particularly acute in South Africa, a country with high levels of unemployment and inequality and an ambitious development agenda. South Africa’s exposure to coal mining as a source of export revenues, as a fuel for domestic power generation and as a key employer in certain provinces presents significant transition risk which is mirrored in many other resource exporting countries. Conversely, South Africa could gain via lower oil prices, through new markets for minerals used in low-carbon technologies (e.g., platinum and manganese) or through the creation of new jobs in industries which are more resilient to, or would even benefit in, a low carbon world, compared to today. This report outlines the measures that South Africa and its partners can take to reduce climate transition risk, avoid potential economy-damaging risk concentrations and in so doing, reduce the costs associated with the decarbonisation of the South African economy. More generally, this analysis can serve as a template with which to identify and evaluate the financial risk of a low-carbon transition for a variety of countries. Well managed and less concentrated risk can facilitate the transition and lower its cost in countries across the world. Several significant findings emerge from the evaluation of transition risk in South Africa, which are summarised here and are explored in depth throughout the report. Finding 1: The cumulative impact on South Africa of a global low-carbon transition over the period of our analysis (between 2013 and 2035) could be more than $120-billion in present value terms. South Africa faces transition risk of more than $120-billion in present value terms between 2013 and 2035. The analysis shows that these risks will accumulate slowly in the coming years before accelerating in the mid-2020s. Unless the government takes action to mitigate these risks, they could jeopardise South Africa’s investment grade sovereign rating, which would cause further losses. The largest share of risks come from factors which are beyond the control of South Africa itself, including changes to global coal and oil markets which will be driven by changes to global demand. Nevertheless, pro-active government responses to those risks beyond its control can help to mitigate the impact. 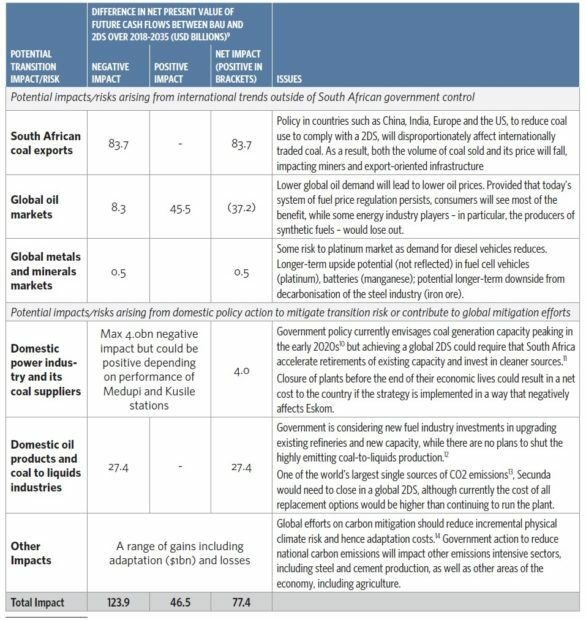 As summarised in Table 1, some transition risks have both potential negative and positive impacts on different parts of the economy, while other shifts in global demand could be positive for South Africa. Table 1: Climate transition value at risk by sector. Finding 2: Much of the risk and potential impact (approximately 75%) is due to factors, policies, and events, beyond the control of the South African government, while nearly 50% has already been realised. Since CPI’s last global coal analysis based on data from 2013 and the start of the work on this project in 2017, the world made significant progress in reducing greenhouse gas emissions, including commitments to the Paris accord. 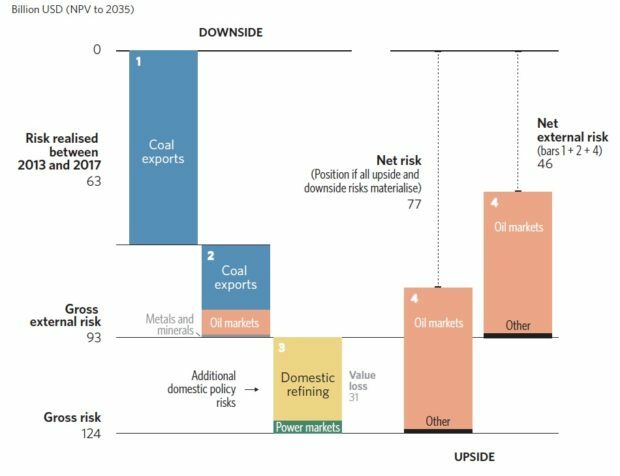 Meanwhile, the risk profile and valuation of fossil fuel energy assets have fluctuated, affected by factors including those related and unrelated to climate policy commitments. These factors include technological change (falls in the cost of wind and solar power generation and Li-ion batteries), new energy market regulation (new forms of market design which value energy system flexibility and support higher penetrations of renewables) and geopolitics – all factors beyond the control of South Africa or its government. Future expectations for “business as usual” coal consumption, and by extension internationally traded coal volumes, have declined significantly as a result of these changes. Fig. 1: Sources of risk in a climate transition (2013-2035). For South Africa, as illustrated in Fig. 1, the result is that by 2017 as much as $60-billion of the value that the country could have expected to earn from its coal resources based on 2013 business-as-usual (BAU) forecasts, had already been lost. That is, by 2017 nearly 60% of the transition value at risk was already factored into revised long-term forecasts for the development of the seaborne coal sector. A further $29,4-billion of value (another 27% of the total) could be lost to South Africa if global coal exports and other markets adapt to a low-carbon transition consistent with keeping global temperature rises “well-below” 2ºC above pre-industrial levels. Coal exports currently provide profits, royalties and tax receipts for South Africa when the revenue from selling the commodity exceeds production costs. Revenues from coal sales also pay back the sunk capital investment in mines and the rail and port infrastructure which is needed to get the coal to the market. If a global low-carbon transition prompts a fall in coal export revenues, not only might miner profits and government taxes be wiped out, there may not be sufficient cash to pay back original investments in mining and infrastructure. The resulting debt defaults could cascade through the economy. Beyond the value at risk driven by international policy and markets, South Africa faces decisions about how it will meet its own emissions targets. While it has taken important recent steps to clarify the direction of its power sector, the future of oil refining and the synthetic production of fuel from coal and gas remains considerably more uncertain. Our analysis suggests that there is an additional $31,2-billion of value at risk in South Africa based upon the decisions to accelerate the retirement of these assets. How these policies are financed and the level of support available from international partners will all shape the effect that South Africa’s domestic low carbon transition will have on the economy and its citizens. Finding 3: The public balance sheet in South Africa would explicitly face only 16% of the downside risk in South Africa with investors facing the rest. However, there are several channels through which business strategy, policy and financial distress may further distribute the share initially borne by investors – often as contingent liabilities to the national government. How risk is distributed through the South African economy is as important as the absolute level. Concentration of risk in one sector, industry or on one company could lead to a collapse which could send shock waves across the economy and magnify the overall impact. Alternatively, dilution of this risk among many groups, particularly foreign investors who have internationally diversified portfolios and investor bases, reduces the likelihood of sector or company collapse and broader economic contagion. The direct or explicit distribution of risk is a function of ownership, contractual arrangements, historic and current policy, taxation and royalties, and business relationships. Companies and the national government have the greatest risk-bearing capacity. However, companies will seek to protect investors by passing risk onto the supply chain, consumers and workers. The allocation of risk in South Africa may change once various parties react to the risk of loss in the value of their assets. Where the risk is not yet priced into listed securities, companies which are alert to climate transition risk may seek to sell them to those which are not yet considering this risk. 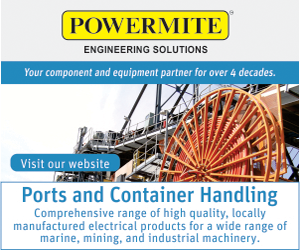 While coal mining companies will seek to recover the shortfall in export revenues by increasing sales to domestic customers such as Eskom, in practice, the ability to do so may be limited. Instead, workers and key counterparties such as Transnet Freight Rail will be forced to bear this risk, with investors bearing the remainder. 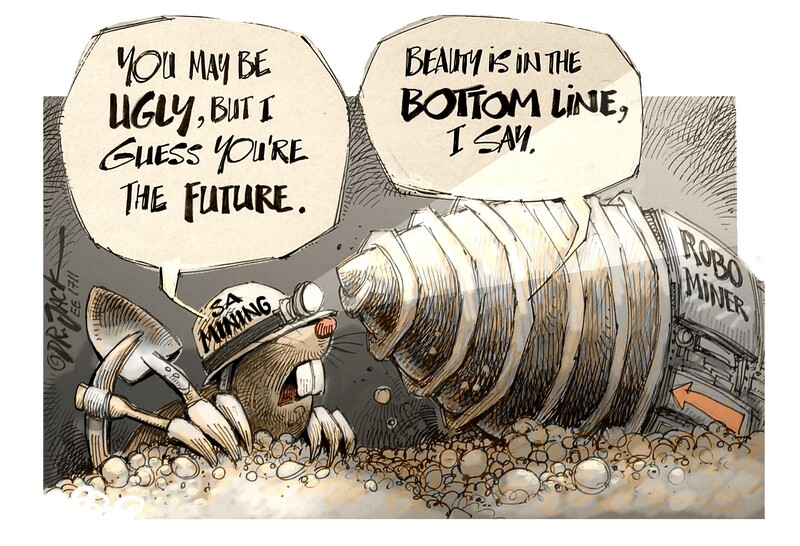 Some mine owners may decide to close assets before the end of their economic lives. Mine closures will hit communities and workers through job losses, reduced economic activity and the loss of funding from companies for social infrastructure. Municipalities where assets are located may suffer the greatest impact, but the spread of transition risk will be broader. Lower national taxes will reduce transfers to municipalities, curtailing their ability to provide services and to pay their obligations. As with municipalities, many companies will not have strong enough balance sheets and may appeal for government assistance. National government could find itself faced by sharply increased costs due to either bailouts or decommissioning costs following bankruptcy. Government may find itself obliged or expected to absorb the impact of the transition in other ways. Government may support workers who lose their jobs or provide funding for unemployment benefits and retraining, or to provide finance and assistance to struggling municipalities to attract new job-creating investment. However, its capacity to provide this support could be constrained by lower tax revenues and an increase in non-performing loans and an erosion of the capital bases at state-owned financial institutions such as the Development Bank of Southern Africa (DBSA) and the Industrial Development Corporation of South Africa (IDC). Fig. 2: Implicit transfers of climate transition risk. Our analysis, as summarised in Fig. 2, found that after these implicit transfers, the distribution of transition risk could become markedly more concentrated on national government, with the latter’s share of the cumulative risk facing South Africa almost tripling from nearly 16% to more than half. Finding 4: The current South African system of incentives for new capital investment favour some existing industries which are exposed to transition risk, rather than new sectors which may create more sustainable sources of jobs and economic growth. Currently planned investment decisions could add more than $25-billion to the country’s transition risk. The South African government uses a range of incentives to attract investment in the country, including fiscal incentives, government or SOE-led procurement and access to debt and equity finance from state-owned financial institutions. However, new investments in assets such as mines, infrastructure and refineries could add to the transition risk faced by companies, investors and the government if lower future revenues under a 2DS are insufficient to cover the investment cost and losses and/or defaults ensue. Our analysis, supported by recent research from IDDRI, suggest that these investments could be avoided with limited impact on security of supply of coal, power or fuel. Table 2: Future investments that could increase transition risk above the level in our analysis. New assets, mines and infrastructure could add to the transition risk faced by companies, investors and the government, if lower future revenues under a 2ºC scenario are insufficient to cover the investment cost. We identified further investments which would add more than $25-billion to the risk that South Africa could face in a global low-carbon transition. If this sum was instead invested in industries or assets which are more resilient to transition risk, or benefit from a low carbon transition, it could spur a more sustainable source of jobs and economic growth. Finding 5: The South African government can still mitigate much of this risk, provided that it plans in advance to develop the fiscal, financial and policy tools required to shift transition risk away from parties without the capacity to bear it and to capture transition-related upside. The timing of government action to mitigate transition risk will be critical, especially given the country’s limited fiscal space after recent downgrades left the country close to losing its investment grade sovereign credit rating, the fast-deteriorating financial position of Eskom and resulting deterioration in the reliability of the electricity supply. Close power plants and fuel production assets too fast and the cost of generating or procuring replacement power and fuel could limit the government’s ability to spend on social programmes and have a significantly negative impact on the workers and their communities. Act too slowly and continue to provide finance to new infrastructure predicated on a rise in future coal exports and the country could suffer a rise in debt downgrades and defaults when the expected export demand does not materialise. By first incorporating transition risk assessment into the planning of government, state-owned enterprises and state-owned financial institutions, policymakers will be better informed when developing long-term emissions abatement strategies for key emitting sectors, such as coal mining, synthetic fuel production and cement making. They will also be better prepared to make the most of the benefits that a global low carbon transition could bring, particularly a net benefit of more than $40-billion from lower oil prices. Fig. 3: Taxing the gains from a lower oil price could halve transition risk to the public balance sheet. Lower oil prices could dampen the effect of falling coal exports on the balance of payments. A more proactive policy could use the benefit of lower oil prices to offset risks from other sectors. For example, national government might choose to increase taxes on oil products, diluting the benefit to consumers but reducing its own risk. 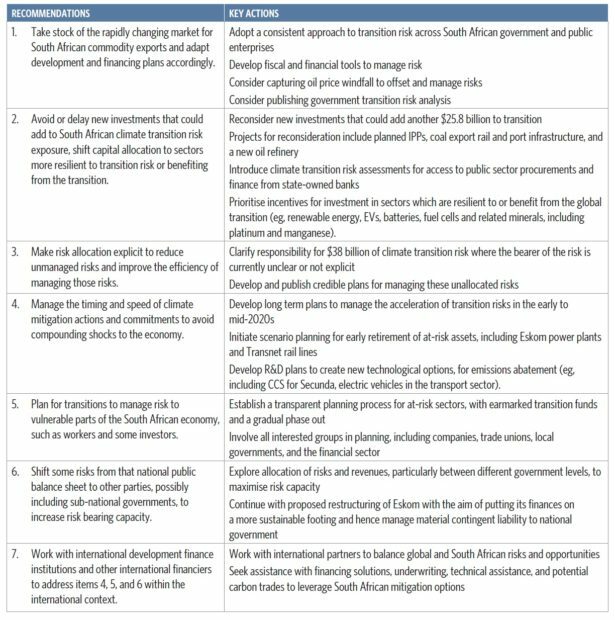 Table 3: Key recommendations for the South African government. Additional fuel tax revenues could be redistributed to parties struggling to bear the negative effects of the transition and/or retained to offset any pressure on the sovereign credit rating, as illustrated in Fig. 3 and as shown in Table 3.